From The Verge, Free trials are very nice — especially when they last three whole months. 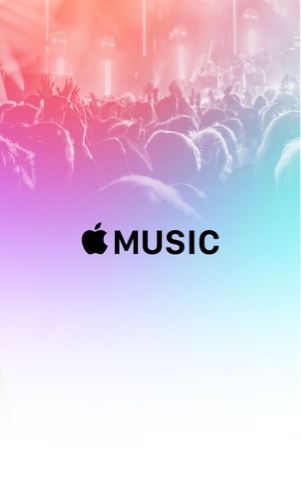 Sign up for Apple Music, and that's exactly the deal you'll get. If you start streaming from Apple's new $4.99/monthly service today, you'll be charged for a month's subscription on September 30th. That's pretty far away, and it's very easy to forget about renewal dates. Admit it: you probably paid for a month of HBO Now even if you didn't mean to. 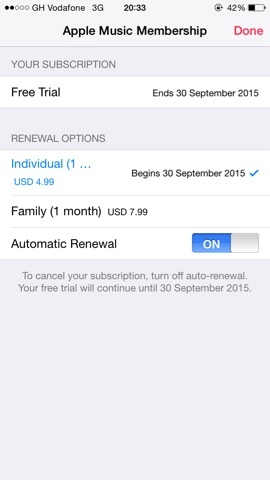 So why not just turn off Apple Music's automatic renewal right now? That'll give you the freedom to try it out for the next few months and simply turn it back on if you decide it's superior to Spotify and other contenders. There are a few ways of accomplishing this. Since you'll be using Apple Music on your iPhone or iPad, that's probably the easiest option. Open up the newly updated Music app. From any of its main tabs, you should see a silhouette in the top left corner. Tap that, and select "View Apple ID." Scroll down to the Subscriptions section and tap "Manage." Here you'll see every subscription tied to your iTunes account — even those that've long expired. Apple Music should be at the very top. Just choose that, and you can either change your individual $4.99 subscription to the $7.99/mo family plan or turn off automatic renewal using what seems to be a button that's survived since the iOS 6 days. If you've already decided that Apple Music and Beats 1 are for you, there's probably no good reason to cancel auto-renewal; you won't be getting billed until the end of September, after all. But if you're still undecided, shutting it off for now is probably the right move.